THIS LATEST RECORDING from Italian guitarist and composer Francesco Lo Castro presents a sequence of twelve originals which weave together qualities of jazz, ambience and soundtrack. Lo Castro is clearly an accomplished musician, surrounding himself here with instrumentalists who, together, are able to illuminate the delicacy of his writing and playing. 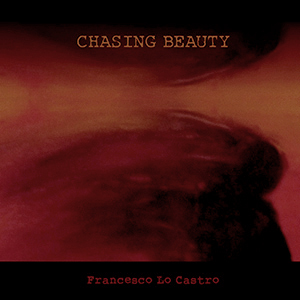 I have been listening to ‘Chasing Beauty’ for some time and have warmed to its gentle guitar-led positivity and charm which, Lo Castro explains, seeks to reflect beauty as “an idea, a feeling that we might never fully understand but which is worth chasing”. Opening number Dresden immediately identifies the album’s sanguine outlook, Lo Castro’s pin-sharp melodies partnered by Dora Maria’s violin, scurrying along above a wash of guitar effects, Saverio Gerardi’s rhythmic impetus and Noa Bodner’s backing vocals. A son’s tribute, Father, takes a simple folksong-like guitar tune and develops it into a quietly buoyant hymn of gratitude (not unlike the movie scoring of Mark Knopfler), Fulvio Sigurta’s mellow trumpet enhancing Lo Castro’s tender lead. With percussion, shimmering guitar effects and Joe Fowler’s lithe, soft-toned flute, Sahara might easily evoke the shifting sands of North Africa – an amiable and bright musical journey; and As It Is hints again at Lo Castro’s ear for soundtrack – delightful harmonica and vocals from Bodner, and muted flugel reminiscent of Paolo Fresu. The exquisite Love speaks briefly and romantically, leading to May 2011, an infectiously cheery and folksy outing (Lo Castro’s style sounding remarkably similar to that of Frode Alnaes) and Maurizio Minardi adds characteristic accordion. Gentle bossa If I perpetuates the feel-good, as does the vocally introduced Embrace and the perhaps more mysterious Dark Smiles. Carefree and ‘lazy, hazy’ Bunch of Houses and Wonderful Memories is a short, sweet miniature (Minardi on sax) followed by the serenely wistful flute melody of Nino and Dunia. Peter Pan closes the set in upbeat theme-tune fashion, its catchy electric lead melody and general exuberance (not to mention Lo Castro’s dexterity) a real pleasure. Amongst the numerous albums which arrive at my door for review, the majority are exciting ‘boundary pushers’. But ‘Chasing Beauty’ is different… and pleasingly so, for its unashamed honesty, high spirits and (simply) this fine musician’s ear for a good tune. Banish the ‘Winter blues’ with Francesco Lo Castro’s own brand of optimism!